Forget about the classic peanut butter and jelly pairing. What goes even better with our favorite sweet and savory nutty spread: Banana. This creamy, protein-packed meal will keep you full all morning long. And the best part is it's ready before you even roll out of bed. 1. 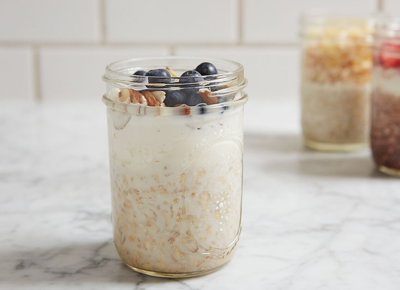 Make the Oats: Pour the oats into a 1-pint mason jar. 2. In a small bowl, mash half of the banana with a fork. Add the peanut butter and the honey and mix to combine. 4. Screw on the lid and refrigerate overnight, about 8 hours. 5. ﻿Make the Toppings: In the morning, top the oatmeal with the peanut butter mixture and banana slices. Eat immediately or screw the top on and take it on the go.